In most situations, I lean all green, chemical-free, plant based, holistic and natural. I hold my cleaning supplies to these standards as well. Except, when we are traveling in the van. 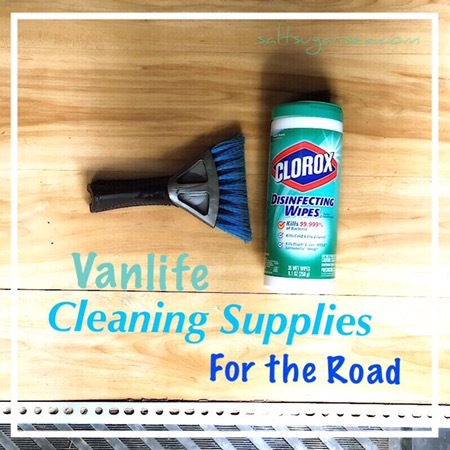 Cleaning supplies for Van Dwellers and Road Trippers must be at a higher level of clean. Travel cleaning supplies need to provide a sanitized clean. Cleaning your own dirt is one thing. Cleaning germs from someone else’s dirt is quite another. We are in, and out of a thousand random places. Many of these places include public spaces, and public restrooms. I will always prefer the tree over a public restroom, but we do not always travel in the wild. Quite frequently, we have to go through town, and behave like modern civilized society. Park Your Shoes at the Door. Hence the welcome shoe rack in the sliding door doorway. 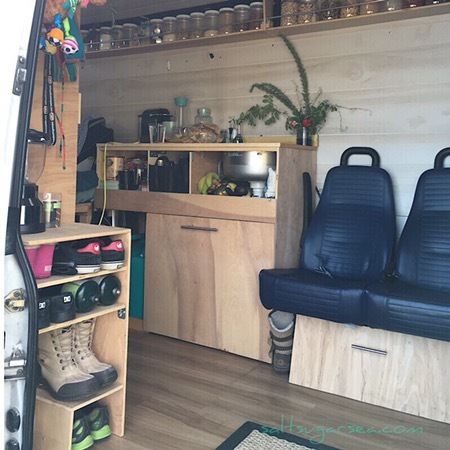 See more of our diy van here. Using valuable space to build a shoe rack may not appear to be more of a luxury item, than a necessity item. But, for our set up, a shoe rack was a necessity. Especially since 90% of our travels revolve around rainy (mud), snowy (wet), beachy (sand) elements. Even with the “Park Your Shoes at the Door” rule in place, daily cleaning is still required. However, with under 80 sq ft of living space, cleaning is a simple chore. We only need 2 cleaning supplies to give the van a full sanitization. These two cleaning supplies do it all. They clean, they sweep, they mop, and they disinfect. You can easily find them for minimal cost at many locations, such as Walmart, Target, Walgreens, grocery stores, or Home Depot. They are small, lightweight, and can be stored practically anywhere. This makes them perfect for small spaces, like van conversions and RVs. We usually carry these travel cleaning supplies in our shoe rack by the sliding door, or in the passenger step area. In this location, we can easily access them from inside, or outside the van door. There is one more cleaning item that I would add to this list. It’s necessity is dependent upon your situation. I.e., if you travel with a pet. If you do, I would add a lint roller to the list. 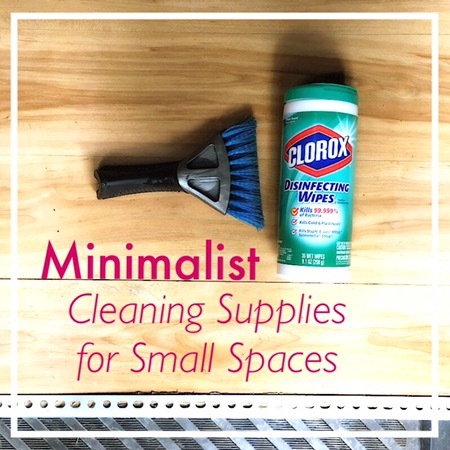 Small spaces can quickly feel dirty, if they are hairy. There is also this nifty pet hair remover gadget CarPet Pet Hair Remover for about $8 on amazon. It’s smaller than a lint roller, and I have been meaning to order one to test it out. I’ll add my thoughts on it, once I’ve given it or try. If you’ve used this pet hair remover, how did you like it? Also, if you know of any other awesome travel cleaning supplies, please share them with us in the comments! You are welcome to Pin any of these pictures to your Pinterest. In fact, we would absolutely love it if you do!